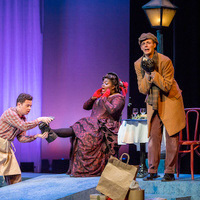 The Webster University Opera Studio presents scenes from operas for their winter showcase, directed by Jacob Lassetter. Performances will take place in the Heagney Theatre at Nerinx Hall Jan. 19-21. Admission is free to all students, $10 for general audiences and $5 for seniors. This fully-staged and costumed production is presented with the support of the Webster University Conservatory of Theatre Arts, Opera Theatre of Saint Louis, and the Repertory Theatre of Saint Louis. Webster University Opera Studio presents complete works and scenes from all periods of lyric theatre. Students receive training in singing-acting, role preparation, and character development. The skills and experience gained from Opera Studio give alumni the tools to succeed in top graduate programs, young artist programs, and international performing careers. Opera Studio provides vital performance training and opportunity for the next generation of singer-actors. This highly select ensemble of singers is open to all Webster University students by audition, culminating in two fully-staged productions every year. For more information, visit webster.edu/music.